Brooklyn, NY | The Caesura was built with the environment and long-term sustainability in mind, incorporating energy efficient elements throughout the design. With sustainability at the core of its mission, Jonathan Rose Companies wanted to promote resident health, conservation, and energy efficiency. 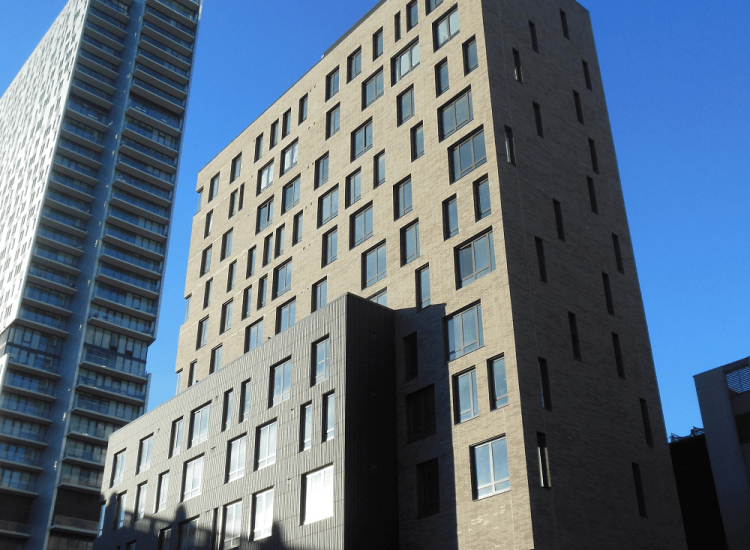 The team worked to ensure the design consisted of high-performance measures including insulation, low-e double-glazed windows, and Variable Refrigerant Flow (VRF) heating and cooling systems—one of the first applications of VRFs in affordable housing. Because the VRF system does not create façade penetrations, it reduces air infiltration, thereby reducing heating and cooling costs. Unlike conventional PTACs, the VRF system does not take up valuable floor space in each apartment. To ensure VRFs were the right systems for Caesura for the long-term, Bright Power assessed the savings impact of the VRF systems on maintenance and operation costs, not just initial installation costs. Thanks to these features, The Caesura achieved LEED for Homes certification.